Please note that the content of this book primarily consists of articles available from Wikipedia or other free sources online. 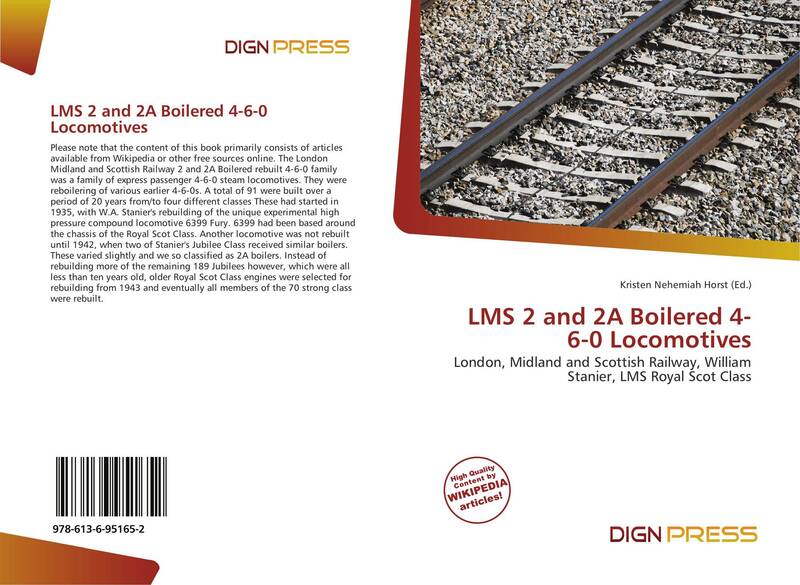 The London Midland and Scottish Railway 2 and 2A Boilered rebuilt 4-6-0 family was a family of express passenger 4-6-0 steam locomotives. They were reboilering of various earlier 4-6-0s. A total of 91 were built over a period of 20 years from/to four different classes These had started in 1935, with W.A. Stanier's rebuilding of the unique experimental high pressure compound locomotive 6399 Fury. 6399 had been based around the chassis of the Royal Scot Class. Another locomotive was not rebuilt until 1942, when two of Stanier's Jubilee Class received similar boilers. These varied slightly and we so classified as 2A boilers. Instead of rebuilding more of the remaining 189 Jubilees however, which were all less than ten years old, older Royal Scot Class engines were selected for rebuilding from 1943 and eventually all members of the 70 strong class were rebuilt.